Where have the real heroes gone? The world has been overrun with brooding antiheroes, sociopathic urban vigilantes and amoral existentialists! How could a confused culture take comfort...if not for the FIGHTING AMERICAN? 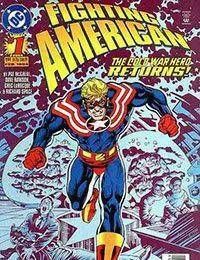 The Fighting American - the classic American hero of the 1950s created by the legendary team of Joe Simon and Jack Kirby - is back in action in a slightly skewed tightrope thriller of sky-high adventure. Created to battle a Red Menace that no longer exists, the Fighting American takes on the bewilderingly different social and political threats of today. Battling whatever bizarre menaces crop up, the Fighting American tackles characters like the Media Circus, the pug-ugly Gross National Product and the deficit-spending Def Izzit...threats masterminded by the diabolical masters of the non sequitur, the Free Association. In the mid-1980s, Johnny Flagg was one of the most vocal foes of the Red Menace. Every day, he stood on the front lines of the media blitz battling Communist cadres with his muckraking daytime television talk show, Flagg Waving. Then, Johnny was gunned down by the minions of the evil Ivan Poison Brotski, leaving Johnnys frail and timid brother, Nelson, to carry on the fight.